shomi broke the fourth wall with its recent marketing campaign that launched in two phases, an initial launch of the creative and then a 'hacked' phase that brought Mr. Robot's fictional hacker group 'fsociety' into the real world. Supporting the season one launch of Mr. Robot on shomi, the two-phased campaign included out-of-home, social media, television, website takeover, experiential elements and transmedia storytelling. The campaign was in market from February 15th to April 7th, with the 'hacked' phase taking place during the last two weeks. shomi developed the campaign with Rethink, North Strategic, OMD, and Corus Entertainment. "Inspired by Mr. Robot's plot, which blurs the lines between reality and fantasy for its main character, we worked with our partners to do the same in our campaign." said Rita Ferrari, Senior Director, Head of Marketing & Communications. "By intertwining the fictional 'fsociety' into our creative concept and having them take control of the campaign with real life events and transmedia storytelling, we not only promoted the series launch in a unique way that completely aligned with the narrative of the show, but we also rewarded super fans of the series." the other appeared to be a hack of shomi's previous brand spot that ran earlier in the year. In addition, the hacked version ran in cinemas showing Batman v Superman, during the theatrical premiere weekend. Digital out-of-home included TTC Platform Video Screens and the Elevator News Network. The campaign also included display ads, Google Search, a page takeover of Twitch.tv and targeted ad buys on Reddit.com. As part of the second phase of the campaign, the out-of-home and digital ads in Toronto and Vancouver were 'hacked' by 'fsociety' midway through the campaign. The hacks were based on the series premise of a massive redistribution of wealth perpetrated by the hacker collective know as 'fsociety'. 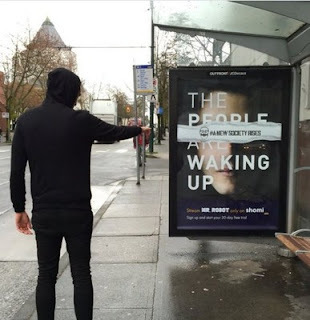 The altered signage featured region-specific hashtags #weareall1sand0s (Toronto) and #anewsocietyrises (Vancouver). The hacked creative encouraged consumers to follow the hashtags on Instagram and Twitter. The hashtags led to video and image postings from the Instagram account hell0fr13nd, which gave daily clues to four locations for 'money drops' from 'fsociety' between March 30th to April 1st. Consumers that followed the clues on social media were rewarded with a branded package containing C$50 bills. The hack engaged super fans of the series by sending them direct messages via Instagram or hand delivered packages from 'fsociety' inviting them to take part. The programme included sponsored content pieces in Techvibes, Vancity Buzz, Notable and Narcity Toronto. During the three days of the 'money drops' hell0fr13nd was organically followed by over 9,500 followers and resulted in 160,000 estimated social media impressions. Additional support included a real-life activation as 'fsociety' took over the Toronto arcade bar Nightowl, on March 23rd. The event featured a five-foot decal of the unmistakeable fsociety mask on the exterior of Nightowl and fsociety signage throughout. The event was attended by media, influencers, shomi members and resulted in 700K social media impressions. To watch Mr. Robot and other exclusive TV shows wrought with conspiracy, including Wayward Pines, Under the Dome, and 12 Monkeys, Canadians can subscribe to shomi. Members will also discover great movies, entertaining Collections, plus hand-picked kids and family content to enjoy together. Visit shomi.com for all the details. The whole of season one of Mr Robot is also out on DVD and Blu-ray in the UK today.